Whenever self-important reviewers such as myself complain about the preponderance of blockbusters and their dominance over ticket sales at multiplexes, it's because there are films like La promesse that, with a tiny budget and a persistence of vision, communicate so much more that most massive special effects spectacles ever could. It's not really a proposition of either/or--I like both sides of this coin--but if I had to choose one or the other, I'd always call for “heads.” Simple tales of humanity are far more meaningful and far more deserving of our dollars and our praise. 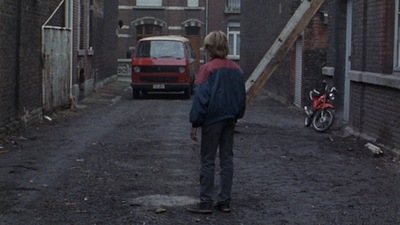 La promesse is the 1996 effort of Belgian brothers Luc and Jean-Pierre Dardenne, and it's largely credited as the movie that brought these talented filmmakers to the attention of the rest of the world. La promesse stars a young Jérémie Renier, a Dardenne regular. Like Jean-Pierre Léaud in Francois Truffaut's films, Renier has literally grown up over the course of the Dardenne oeuvre. Here he plays Igor, a confident and cagey young crook who is, at least at the start of the picture, engaged in two apprenticeships. One is with the increasingly frustrated mechanic (Frédérique Bodson) who has given the kid a job, and the other is with the boy's father, Roger (Olivier Gourmet), a hustler who is making bank smuggling immigrants into Belgium and then putting them to work on his construction sites while simultaneously siphoning off their wages for outrageous rental fees and other necessary gray-market aid. Roger isn't a completely bad guy. He loves his son and is ostensibly doing all of this to buy a house where they can live, but he is blind to the toll his actions take. Not just on the immigrants, but on Igor, who is being robbed of a regular adolescence and also of better opportunities for his adult future by learning the family business at the expense of a legitimate education. Igor's life starts to pivot with the arrival of Assita (Assita Ouédraogo) and her baby. She has come from Africa to join her husband and the child's father, Hamidou (Rasmane Ouédraogo), who has already been working for Roger for a little while and is in debt both to him and to the gangsters he gambles with. Igor gets along with Hamidou, and he takes a liking to Assita, who is headstrong and clings to the culture and religion she brought with her. When Hamidou is injured in a construction accident, he makes Igor promise to look after his family. The boy takes this debt seriously, though his father sees things differently. If anyone finds out Hamidou is dead, it will mean serious consequences for him and Igor both, and Assita is the only one likely to wonder where the man has gone. It's from such a fragile construct that great things emerge. La promesse is not heavy on traditional plot. This isn't a potboiler or any other sort of predictable crime film, even if criminal behavior is at its narrative center. Rather, the positioning of these characters, who they are and what they do, provides the seeds for the greater story to grow. 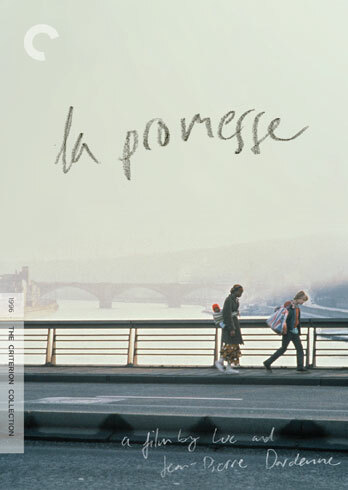 La promesse is a film about how people get along and how they react to unexpected circumstances. More importantly, it's a story about how one boy comes to recognize his own conscience and develop his own ethical code in the face of some heavy opposition. Jérémie Renier was born to be in front of a movie camera. His presence on screen is unaffected and natural in the most convincing and compelling sense. His performance has none of the woodenness that sometimes emerges when Neorealist directors cast non-actors or indie filmmakers work with amateurish newcomers. There isn't a moment of La promesse that comes off as rehearsed or scripted; the Dardennes elicit a true illusion of spontaneity from all of their performers. Olivier Gourmet is particularly effective as the father. He seems to always be one step behind what is happening, caught up in his own efforts to be one step ahead. The climactic scene between Roger and Igor is heartbreaking, frustrating, and dangerous. Like the boy, we are almost sucked in by the man's defenses, even though our gut tells us he'll do whatever it takes to survive. Much of the spontaneous feel of La promesse is down to how the movie is shot. The Dardenne Bros., alongside director of photography Alain Marcoen and camera operator Benoît Dervaux, favor a more stealthy aesthetic. They don't plan big, elaborate shots or frame any of their scenes in ways that call attention to the construction; rather, they prefer more intimate, fly-on-the-wall positioning. 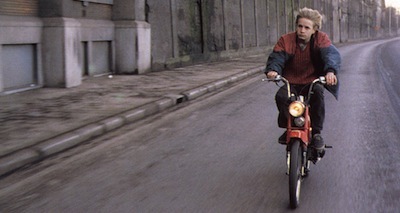 Following the characters, tracking their reactions, staying with their faces--this is the visual power of La promesse. 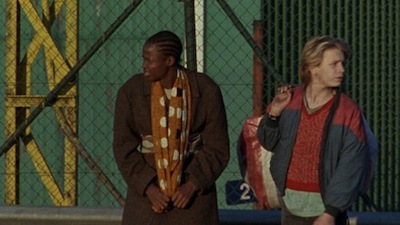 There are no self-conscious handheld jitters, nothing here that would put La promesse in the faux documentary genre or that precedes the jiggling, probing zooms of mumblecore, and even so, it plays as a movie that was captured off-the-cuff, as things were happening, all the same. The suspense of La promesse is not really in seeing how Assita and her baby get along, though as audience members we certainly become invested in their journey; rather, the pins and needles come from wondering how much of himself Igor will compromise. Will he or won't he go all the way and tell the full truth? The Dardennes are careful not to telegraph the conclusion, letting the throughline stretch all the way to the final scene. And then when it comes, they let the movie close on just the right note. The small action of the individual may have big meaning, but the ripples it causes may also be imperceptible. The fact is, life rarely stops, not even in the most tragic of times. Regardless of the moral justifications or the peace that may come from sharing difficult truths, the earth does not shatter, nor do the people exposing the lies or those receiving the knowledge. You take one breath, and then you take another, and so it goes.